In the midst of the Brexit chaos, prominent Tories are using language that encourages the crank right and the wannabe militiamen. And the media is ignoring or making excuses for them. 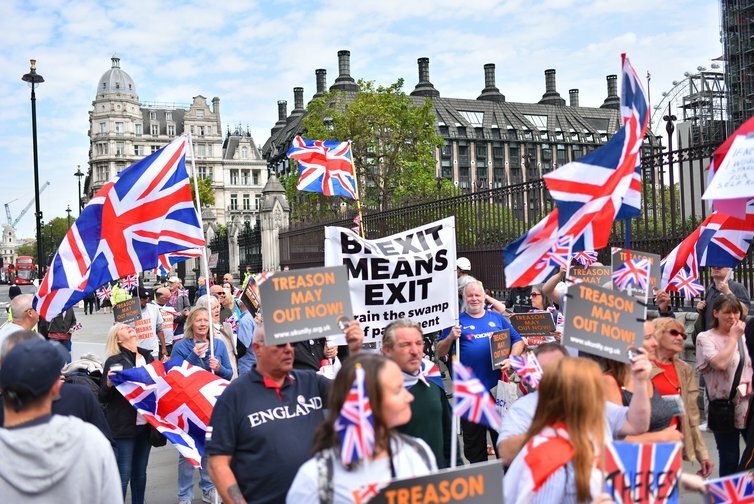 Pro-Brexit demonstrators outside parliament with banners labelling a soft Brexit as "Treason"
On Monday, we learned that senior pro-Brexit Tories (all white men) had nicknamed themselves the “Grand Wizards”. On Tuesday, that the pro-Brexit Bruges Group of Tory MPs had held a meeting at Westminster which called for a “Blueshirt” street movement to riot until Brexit was delivered, and in which senior MP Suella Braverman said they’re in a “war” against “Cultural Marxism”. We’re told by mainstream commentators not to feel too worried about any of this. The BBC’s political editor Laura Kuenssberg reassured us that the Brexiteers were using the Grand Wizard nickname “informally, no intended connection to anything else”. Others have however noted that Michael Gove had run into trouble for comparing himself to a “Grand Wizard of the KKK” before. The blueshirts might evoke Hitler’s Blackshirts or Mosley’s Brownshirts (or indeed, the earlier, fascist Irish blueshirts), but calling for such a force is “less menacing” than it sounds, the Guardian’s Peter Walker told us, because they’re mostly old men. The Tory MP and hard Brexiteer Suella Braverman “probably wasn’t aware” of the history of the term “Cultural Marxism” when she used it, we’re told by most commentators – even though she was challenged by Guardian journalist Dawn Foster on its use as a far-right talking point and by the terrorist Anders Breivik, and merely doubled down. Yesterday, a cross-party group of a dozen British MEPs wrote to the BBC accusing them of normalising “white supremacist language” and “conveying such extreme-right dog-whistles” with an inappropriately “lighthearted” reaction from its journalists. The BBC has yet to respond. The idea that such terms are just accidents, at this precise historical juncture, and/or entertaining banalities barely worthy of serious media comment (contrast the considerable attention given to anti-semitism in the Labour party) is worth examining. Cultural Marxism is a conspiracy theory popular amongst the far-right, and, as the Jewish Board of Deputies commented this week, a well-known “anti-semitic trope”. It paints a bunch of German Jewish twentieth century academics known as the Frankfurt School, who were interested in critiquing contemporary mass culture and who decamped to America to escape the Nazis, as seeding a widespread conspiracy to bring down white “Western Civilisation” with an evil mash-up of Marx and Freud (“both Jewish!” cry the crank right). The term was given its current common usage by various conspiracists and paleoconservatives in the 1990s – most notably, in a video by William Lind which widely disseminated across the internet. Lind reportedly told an audience at a Holocaust denial conference that the Frankfurt School “were all Jewish” (he did also tell them he was “not among those who question whether the Holocaust occurred”). A key tenet of the “Cultural Marxism” conspiracy theory as disseminated explicitly on countless websites, is that it encourages immigration and multiculturalism to undermine “Western Values” (essentially being used as code here for “white, non-Jewish people”). The mainstream right, meanwhile, treads more carefully, usually restricting itself to suggesting that “Cultural Marxism” is what is preventing the right to free expression of ‘legitimate concerns’ about immigration. The idea of “Cultural Marxism” was popularised by right-wing US politicians like Pat Buchanan and more recently has been taken up enthusiastically by the Steve Bannon/Breitbart-inspired ‘alt-right’. These groups have embraced and promulgated a narrative in which “Cultural Marxism” promotes its plot against “Western values” through “culture wars” on university campuses and in other public institutions, supposedly now wholly dominated by a takeover by 1968 radicals and their “culture warrior” and “social justice warrior” offspring, “snowflakes” who are imposing “political correctness”, clamping down on “free speech”, lowering standards and weakening the nation’s youth. If this is all sounding a bit wearily familiar, it’s because this diagnosis of the world’s ills – explicitly named as “Cultural Marxism” – has been regularly recited by outlets like the Telegraph, the Spectator and Spiked, and indeed leaks from there into the BBC. Of course, the ruling class and its more obedient acolytes can’t stand discussion of ideology, culture and identity, about the power of language, about what is discussed, because they don’t want us to notice that these are their weapons of choice. Don’t want us to notice, for example, that the most successful weaponiser of ideology, of hegemony, was (as Stuart Hall foresaw) Thatcher and her ideologists. The Institute of Economic Affairs’ neoliberal ideas are (despite their protestations to the contrary) far more influential in most of our institutions and daily lives after their own 40 year-long march. Universities (you wonder if the average Daily Telegraph reader has been near one lately) in reality bombard students with injunctions to be “entrepreneurial”, “resilient” and other codes for “man up, bucko”. And it’s the academic disciplines most able to be wielded to defend this harsh and unequal state of affairs that are given the most prominence in the media and publishing, from evolutionary psychology and neuroscience to economics, behavioural or otherwise. Across education, the idea that “Western” (read white, patriarchal and colonial) culture is the highest state of being imaginable has been entrenched in history curricula (via Michael Gove and his advisor, pro-Empire apologist Niall Ferguson). Despite this reality, the Telegraph and Spectator readers and indeed BBC viewers and listeners are presented, by the likes of Douglas Murray, James Delingpole and others, with a world where “critical” and “cultural theorists”, infused with the spirit of Frankfurt School fellow traveller Marcuse and Italian theorist of “hegemony” Gramsci, have undertaken a “long march through the institutions” and are using their hegemonic power to perpetuate outrages like, er, protests against hate speech provocateurs like Milo, a desire to understand and examine colonial legacies, and demands for literature syllabi to include a few texts that aren’t by dead white men. In today’s Britain (and elsewhere) it’s migrants and people of colour who must navigate an increasingly “hostile environment” where the threats of attack, exclusion, surveillance, detention and expulsion are ever-present. But it’s white people who the Right, in one dog whistle or another, presents to us as the real victims, their “freedoms” (of speech, financial advancement, and sexual partners) threatened by queers, “cosmopolitans”, feminists, the EU and Islam. But such a recasting opens up space for those who take the ‘mainstream’ right’s intellectual antecedents at their word – the nativists, the anti-semites, the white supremacists, the ethno-nationalists. It’s only a short hop to giving a platform to outright neofascists like Generation Identity, as BBC’s Newsnight notoriously did on the day of the Christchurch massacre. And platforms to wannabe militia leaders like Tommy Robinson, who the same programme promoted an interview with using his preferred framing of ‘free speech’ (complete with an image of him being ‘gagged’). Brexit, of course, played ruthlessly on these messages – most notably in its invocations of Turkey being about to join the EU, and in the subsequent labelling of anti-Brexit MPs as “traitors”. Is it then, really just harmless fun, just a bit “ironic”, barely worthy of media comment (with the honourable exceptions of Dawn Foster, Jon Stone in the Independent, Peter Walker and Owen Jones in the Guardian, and the Jewish Chronicle), for prominent Tories to be floating the idea that we’re at “war” against “Cultural Marxism” and that we need both “Grand Wizards” and a “Blueshirt” street force to fight back? Is it really just accidental that right in the midst of the Brexit unwinding, the right wing of the Tory party appears to be dropping easter eggs (to use a gamer term) encouraging the crank right and the wannabe militiamen? Is it really ok for them to do so, when already one anti-Brexit, pro-immigration MP was murdered during the Brexit referendum by a far right terrorist, others like Anna Soubry can’t go home for fear of their lives, and when racist attacks on mosques are surging in the wake of Christchurch? And when the odious ‘manifestos’ of murderous white supremacists like Anders Breivik and the Christchurch killer are drenched in such concepts, cobbled together from a toxic mix of “ironically” racist edgelord memes, explicitly fascist thought, and ‘mainstream’ politicians and commentators? Perhaps for evil to triumph, all that is necessary is for good men and women of the press to do nothing except raise an amused eyebrow.